This volume presents a comprehensive collection of essential documents for students and laymen interested in the history of the Holocaust. The collection reflects both the major trends in Nazi ideology and policy towards the Jews and the behaviour and reaction of the Jews to the Nazi challenge. 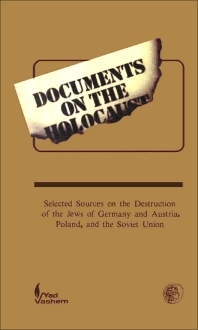 The book is divided into three geographical-political sections: Germany and Austria; Poland; and the Baltic countries and areas of the Soviet Union occupied by Nazi Germany during the Second World War. Each section is preceded by a short introduction setting the documents against the background of events and developments in these areas. For students and academics of Jewish studies, European history and political science. (partial) Foreword. Part One: Germany and Austria: The program of the National-Socialist (Nazi) German Workers' Party. Martin Buber on the tasks of the Center for Jewish Adult Education. SS views on the solution of the Jewish Question. From Hitler's Testament. Part Two: Poland: Instructions by Heydrich on policy and operations concerning Jews in the occupied territories, September 21, 1939. Extracts from the Warsaw Ghetto Diary of Chaim A. Kaplan, 1940. The revolt at the Sobibor Extermination Camp. Part Three: Soviet Union: Special duties for the SS in "Operation Barbarossa", March 13, 1941. From a Wehrmacht report on the extermination of the Jews in the Ukraine. Operations diary of a Jewish Partisan unit in Rudniki Forest, 1943-1944. Selected Bibliography. Index.